We perform four or more concerts a year with professional soloists and instrumentalists, in venues including St Andrew’s Church, Farnham; Farnham Maltings; St Lawrence's Church, Alton; St Andrew’s Garrison Church, Aldershot; and Guildford Cathedral. 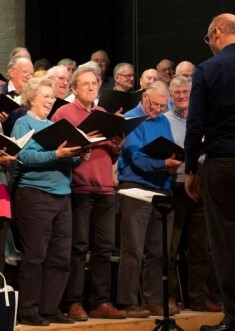 In 2013, the choir commissioned The Mind That Lives – an anthem by Diamond Jubilee composer Will Todd, to celebrate the 250th anniversary of the birth of Farnham’s ‘most famous son’ William Cobbett. Photographs of our concerts are available via this link. These are taken by professional photographer Stuart Kenney, and you can order copies through his website.